Here’s another Chewie entry. Hasbro’s 6″ Chewbacca from the Black Series. 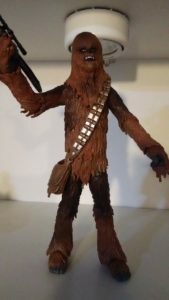 Let’s face it: Chewie’s tough to do in an action figure. It’s tough to sculpt all of that hair. But I think this is a pretty good figure, with good articulation. One nice thing about the Black Series figures is that they’re scaled to each other much more accurately than previous figures had been. So, this Chewie is tall like he should be.